'My own business always bores me to death; I prefer other people's' Lady Windermere has a happy marriage - or, at least, that's what she believes until one of London society's gossips, the Duchess of Berwick, arrives with her daughter to voice her suspicions about an affair Lord Windermere appears to be having. It's not just the Duchess who has evidence, however. Windermere's private bank book shows that he's been giving large sums of money to a 'Mrs Erlynne' - on frequent occasions - and he himself even admits to seeing much of the woman. To add insult to injury, Windermere insists that Mrs Erlynne is invited to the ball that is being held for Lady Windermere's birthday. Employing the witty dialogue, social satire and outrageous paradox for which he is still remembered, Wilde's play shows us the destructiveness of gossip and superficial judgement, examines the ambiguous sexual morality and gender politics at the heart of the British ruling class, while simultaneously challenging our perceptions of what constitutes a 'good woman'. This student edition contains a fully annotated version of the playtext. 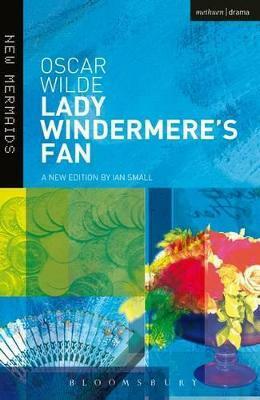 The introduction includes an account of Wilde's life and a detailed analysis of Lady Windermere's Fan as well as its stage history. Ian Small is Professor of English Literature at the University of Birmingham. He is the author of a number of critical studies on Wilde and has edited several of Wilde's works, including a scholarly edition of Wilde's second society comedy, A Woman of No Importance, also published in the New Mermaids series. Ian Small is Professor of English Literature at the University of Birmingham. He is the author of a number of critical studies on Wilde and has edited several of Wilde's works, including a scholarly edition of Wilde's second society comedy, A Woman of No Importance, also published in the New Mermaids series.